Cool stuff you can use. : Talk About an Exotic Car- See this! Talk About an Exotic Car- See this! T-shirts, bumper stickers, and even tattoos are just a few of the common ways music lovers show support for their favorite artists, but there are levels of music fandom that are truly difficult to understand. Take, for example, this 1970 Volkswagen Beetle that has been completely revamped with KISS flair. And no, this isn't just a fresh paint job or clever custom license plate — this VW has undergone some rather stunning aesthetic alterations to make it look just like KISS bassist Gene Simmons. A Craigslist seller has listed the unorthodox ride for a somewhat lofty $10,000, but that price tag gets you a real head-turner of a vehicle. 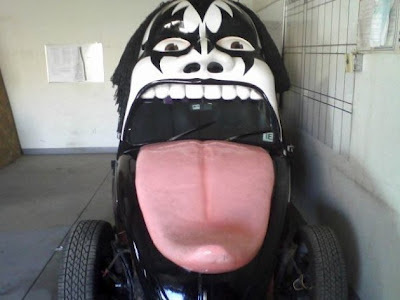 The coupe features the face, hair, and trademark tongue of the aging rocker, and is currently undergoing restoration to ensure any prospective buyers can party every day without worry. Yes, driving this through your local Starbucks will probably get you plenty of laughs and slack-jawed stares, but taking this beauty to a retro rock concert will almost certainly make you an instant celebrity. The car is currently located in Denver, Colorado, but its one-of-a-kind nature will likely garner some attention from all corners of the United States. This car design is just crazy!